My hamster story begins when I was a child about 8 years old (I am now 48). My 2 sisters and I decided we wanted hamsters. We went to a pet store and got 3 "Teddy Bear Hamsters". We didn't know anything about hamsters and the pet store gave us little to no information. Of course we got the cool looking habitrail set up, set it up and put all 3 in. We didn't even know that Syrian Hamsters should be kept in separate cages or provided chew toys. The habitat was difficult to clean and the hamsters escaped all the time. We didn't understand hamster behavior so couldn't understand why they fought all the time and bit a lot. For the most part they were good pets but we didn't bring out there full potential because we didn't know enough about hamster care. Thank goodness they were all males or we would have had an abundance of babies. After they passed away we never got anymore. 4 years ago, my 2 girls were at the local pet store and fell in love with a male Syrian Hamster - yes I know now it is Syrian, not "teddy bear". They begged me for it, but I told them they need to do research and see how to take care of it before we would buy it. They did the research, and what they found out really educated me. They knew more prior to buying a hamster then I ever knew even after having 3 of them! In fact my oldest daughter even informed me we should not get the hamster from the pet store but find a responsible breeder in our area and buy from them. I got online and found a nice hobby breeder in our area and emailed him. Sure enough he had some babies and they would be ready in 2 weeks for their new home. In the mean time we worked on making a homemade bin cage and buying all the supplies. Then the big day came and off we went to the breeders. It was an easy decision for us. One of the black and white banded long hair males stood out to us as the nicest and cutest one. Off we went home. It was the beginning of a beautiful relationship. We named him Gus Gus (after the mouse in Cinderella). He was the nicest pet anyone one could ever hope for! He got so much love from my girls and gave love and joy in return. We ended up entering him in a pet photo contest that Pet-co online had. 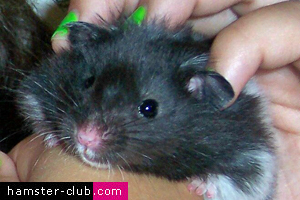 Gus Gus won 1st place in the hamster category and we won a $250 gift card to Pet-co! We were so excited and ran off to get fun stuff and supplies for Gus Gus. Unfortunately we never learned or read anywhere that cotton looking type nesting material was not good for hamsters. Since he loved to shred up Kleenex and make a bed with them we thought that he would sure love some of that cool soft cotton looking bedding. The package even showed a happy hamster using it. We put a wad in his cage at bedtime and couldn't wait to see what he would do with it. The next day when I went to hold him I slowly came to the realization that he was dead. I was devastated. As I did some research into it, I found out that the cotton looking bedding is not safe and can be deadly to some hamsters. Now, it may have been old age because Gus Gus was 3 years old, but I will never forgive myself for giving him that stupid material that may have killed him the day after he won us $250. When the rest of the family got home we gave him a wonderful funeral complete with a song and poem. He is laid to rest in our front yard near a beautiful yellow lily plant. We got another Syrian Hamster - Glowstone and he is still happy and healthy as we speak. As for the hamster my girls fell in love with at the pet store, we hope he got a great home too. I would love to have the hamster guide to make sure we have good up-to-date correct information on care and never fall prey to cheesy marketing or false information ever again! RIP Gus Gus the best hamster in the world!